Was looking for a 70-inch whilte vanity with gray and white countertop, when I saw this it was a perfect match to what I was looking for and the price was great. It came in two days and I am so pleased with the product, I would definitely buy from Overstock again! Needed a 70 inch vanity to fit in an existing space in our kids bathroom, so when I saw this one I quickly ordered it as there aren't many of this size out there. The delivery from Overstock.com went very smoothly and it was well packaged to protect it from being damaged. The quality of this vanity is outstanding. It is very heavy, so you will need help to move this thing around. Good thing is that the counter top and sinks weren't attached, so you can remove those and the drawers to make it more manageable. Pros: - Very good quality/wood - The look of the white with the carrara white marble top is fantastic - Soft closing drawers and doors - Good price compared to buying something locally - This is a tall vanity (i.e. 35+ inches), which I like and is a good height for our teenage girls. If you have small children, then this may be too high for them, but it works for our situation. Cons: - Although they ship the backsplash as a courtesy, it comes in two pieces instead of one. Therefore, you have a seam in the middle. Would be nice to have it in one piece. - The mirrors are too small for a vanity this size. I actually went out and purchased larger mirrors (29 x 35) which look more appropriate with the size of this vanity. - It would be nice if you could get this with rectangular sinks instead of round. The round sinks are decent, but I like the looks of rectangular better. Also, the sinks feel smaller because the overhang of the counter top on the sink makes you lose an inch or so all the way around. Overall, this was an extremely good experience buying an item like this on-line from Overstock.com. Would definitely recommend this vanity to others. In general, I would highly recommend this product. In response to others complaining about the height, this is a kitchen height vanity (typical for vanities in master baths). This might be different from what you're used to, however, I'm 5'2" and no zero problems washing my hands, face, etc. Pros: -Came with marble countertop, sinks, and backsplash (which I cut and used as side splashes) -Finish looks great, and came with a small amount of touch up paint -Soft close doors/drawers -Solid wood shelves and drawers -Looks great; received tons of compliments -Packaged great - no damage from shipping Cons -More specs were not provided online (I had to hunt down pretty common information, like center lines for sinks) -I wish the drawers were a little deeper, and the guides were full-extension -If anything, the sinks are a little too deep! Needed to update our small 90's master bath - couldn't believe we found this vanity that was the exact width to fit the space. Even better is the quality of this cabinet - great drawer slides, beautiful warm white finish and the marble top is gorgeous! Be prepared - it's very heavy, but delivery was as expected - on time &amp; no damage. Would definitely recommend! Admittedly, we were worried since we didn't see it. After receiving it, we were estatic. Solid wood with MDF used internally for structural support. While it's obvious that it's not hand-built from scratch, it would believe them it's hand-assembled by skilled craftsmen. Drawers and doors have a good heavy feel and works as advertised. They could do better by lining or coating the inside of the drawers since this is a bathroom vanity; I'd be worried that water would soak into the wood, but why am I pouring water in there? :-) Overall, for the price, this was way better than we expected for a bathroom vanity. 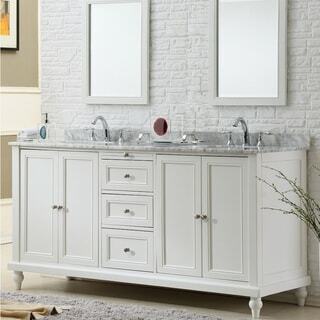 For the record, we ordered this vanity with the "White Carrera" option. This turned out to be the "Carrera Marble" top and NOT the "White Marble" top. OverStock could do better with the product option choices matching the picture choices. Needed a 70 inch vanity to fit in an existing space in our master bathroom, so when I saw this one I quickly ordered it. After lots of searching, there aren't many of this size out there. The delivery from Overstock.com went very smoothly and it was well packaged to protect it from being damaged. The quality of this vanity is outstanding. It is very heavy, so you will need help to move this thing around. We used a dolly to move it around. Good thing is that the 120 pound counter top and sinks weren't attached, so you can remove those and the drawers to make it more manageable. Pros: - Very good quality/wood - The look of the white marble top is fantastic - Soft closing drawers and doors - Good price compared to buying something locally - This is a tall vanity (i.e. 36 inches), which I like, and is a good height for us seniors. The back is open, making it easier to get the plumbing connected. Cons: - The back splash comes in two pieces instead of one, therefore, you have a seam in the middle. Would be nice to have it in one piece. Overall, this was an extremely good experience buying an item like this on-line from Overstock.com. Would definitely recommend this vanity to others. I was nervous about ordering a vanity/sink/countertop online, but once I got this delivered to my home - all my fears dissipated. I got my order quicker than I expected and I was kept well informed about its arrival by the freight handlers. The cabinet/sinks and the marble top were extremely well packaged and protected! Everything arrived in good condition. The cabinet is a true white I would say. The sinks are also a true white. The white marble top is just slightly off white with subtle sparkle in it. I think it's quite lovely and works well for my setting. This was one of the few 70-inch freestanding vanities I could find and that's why I took a chance ordering online - and so glad I did! The drawers and doors are self-closing which I love (especially since my husband never seems to be able to get things shut all the way - LOL). And the description doesn't call it out, but I noticed in the picture before ordering (and love it), the pull out "shelf" at the top above the drawers. A great added feature! I don't have this in place in my master bath which is being remodeled, but if first impressions mean anything - I'm gonna LOVE this! We purchased this vanity for our master bath remodel. It served as our centerpiece focal point which we matched the floor and shower tiles to match the Carrera marble top. It was convenient buying the vanity ready made with the top and sinks included, all we had to do was buy the faucets in the brushed nickel finish to match.It looks very elegant and really transformed the space to a spa like look.The self closing doors and drawers are great and the internal shelves convenient for storage. The height is a bit tall for me ( I’m 5’1) and the sinks are small and set back a bit more than I like. We did receive a matching backsplash but it came in two pieces which we had to grout the seam. They also gave us a small bottle of touch up paint. Overall a good purchase for the price. I am very pleased with my new vanity. It is very well made. The packaging was unbelievable; I've never seen anything like it. I just want to add two observations. First, it states this vanity is a pearl white. I was expecting something off white; it is white. Second, under Features it states the matching back splash is a free courtesy and that it may not match. Mine did not match. This vanity is gorgeous! It was a super tight fit in our alcove, which is only 71" wide. But once it was in it looked like it was meant to be there. A 70" marble backsplash was included with the countertop and looks great on the back of the vanity. The drawers don't come out as far as you would think but they are deep and very well made. The cabinets and shelf are also a huge plus once we routed the sink drain around the shelf, and added a load of more storage options. The shelf also can be adjusted in height using 4 screw in pegs. The sinks were in perfect condition, but were slightly difficult to mount. The rests built into the top for the sinks are a little too low so that when placing the countertop onto the vanity, there is a noticeable gap you must lift the sink up in order to glue the sink to the countertop. You could glue the sinks first, but you may not get them centered the way you want. We just used glued around the sink top and used a jack to press it against the countertop once we had caulked the countertop down, then caulked any remaining openings between the sink and countertop. All in all, this is a beautiful vanity and it brightened out bathroom and is a pleasure to use. We find no discomfort in its height, depth, sink placement, sink size, etc. etc. Truly no complaints and superb construction. Elegant unit--quality finish and nice drawer closure. Marble was packed separately so it was not impossibly heavy to move upstairs into master bath. Fast delivery too! I am so happy with this vanity. I needed a 70" and there were not many available. This is exactly what I was hoping for but not able to find this in local stores at 70". I was hesitant to order something this size/value online w/out seeing it first but I did not have much choice. I was thrilled when I opened this very carefully packaged vanity w/ granite top to see how beautiful it was. I love the hardware, the soft closure doors and the courtesy backsplash granite that was included. Very elegant, beautiful white color, nice hardware, sinks, granite. So pretty! Purchased this double vanity for our master bathroom remodel & I am quite pleased with the quality. ( always a certain amount of concern with a larger online purchase ) The larger backsplash was included w/ the purchase. I did not choose the option of the mirrors. In the end, I wish I had purchased the mirrors as I did not go with one single larger mirror. But not to fear, I found the perfect white mirrors on Overstock to compliment the vanity. ( medium blanco white mirrors ) The shipping process was very good @ keeping us informed. Thankfully my husband was home when it arrived as the single delivery person told my husband that had he not been home & available to help that the vanity would have been left in our driveway @ the curb ( Cincinnati delivery ) But everything worked out well & every piece was in excellent condition. This vanity is a great value for the price--well made, great hardware, looks beautiful! The 70-inch vanity size was difficult to find, so we were left with few options, but ended up very pleased with this choice. The quality of this item is actually Superior Beautiful Finish beautiful top soft closing doors and drawers all wood yes real wood looks beautiful. The sink overflow hole however is backwards you're staring at each time you walk up to the sink. And the sink opening in the Marvel is way too small Overstock should put some pressure on them to cut the marble a little wider it would be an easy fix. But overall a fantastic value unbelievable actually. Love the look, the marble is very pretty. We are having a problem with one of the doors not shutting properly. Inside cabinet has shelves on both sides, so good use of interior space, along with the 3 drawers in center. Don't think it mentions this: above the drawers, there is a shelf that pulls out. The back of cabinet has two large square open cuts, so plenty of space to get to plumbing. Overall, I would recommend. We love this vanity. The top is beautiful. Perfect for our needs. Packed very well. This item is very heavy when delivered. Would definite recommend and buy more from this company.